I think, this morning, my son finally began to understand the awesomeness that is Open Source. He asked, as he has done a number of times before, what it would cost to set up a website, and didn’t seem to believe my answer, which was, of course, $0. So, after he wolfed down his breakfast, we sat down and installed WordPress, got it configured shiny, and he kept asking, how much does this cost? How can it be this good if it doesn’t cost anything? This looks really professional. Are you sure this is free? At one point, while we were tweaking the theme, he said, in a very roundabout “I’m sure this is way too hard” kind of way, that some day, in the distant future, he’d like to have forums on the site, where people could discuss things. I installed BBPress in under a minute, and said, you mean kinda like this? He also asked whether it was possible to have his own hostname, and so I taught him a little bit about how DNS works, and showed him how to register a name, and then how to configure DNS to point a name at an IP address. So, about 30 minutes later, he’s got his own website, where he’ll be posting his youtube videos, animations, and random comments about the world. No, I don’t really know what the name means, so ask him, not me. Disclaimer: I don’t require, or even particularly care about, your approval of my parenting style. I will cheerfully ignore any parenting advice you offer. Unless you’re my parents. My kids are very goal-driven. My son wants to save for a new iPod. My daughter wants a particular pair of shoes. These things motivate them. But when it comes to something as pointless as taking out the garbage or vacuuming the living room, it’s hard to get them to see the point. They’ll do it when told, but they’re not likely to think of it on their own. We’ve gone through a number of experiments in getting them motivated to do their chores, including tying what chores they do to how much allowance they get. But that’s a huge hassle to keep track of. Last week I decided that since I like hacking on Open Source anyway, I’d throw something together to both track what chores they’re doing – so that it’s less work for us – and also to provide them with some incentive. So, here it is: Chores is a PHP/MySQL web app to track what chores they’re doing, and tie their allowance directly to that. I chose PHP because it’s easy and, more importantly, I thought it might lower the bar to getting other folks to pitch in, whereas mod_perl or mod_lua might make it certain that I’d never get any help. Manage user accounts, and define how much money a point is worth for those individuals, so that each person can have a different base allowance. 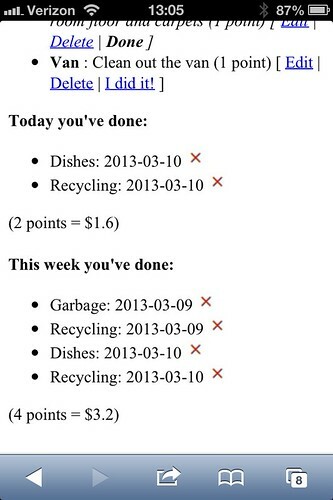 Manage chores, and define how many points each chore is worth, and how frequently it may be done. Track when a chore has been done, who did it, and when it can be done again. Tell you how much you have earned today, and so far this week. Provide reports of allowance earned for any given time period. Formats nicely on the iPhone, iPod, and Nexus7, so that the kids can use it from whatever mobile device they have in their hands at the time. I have other stuff planned, but for the moment we’re kind of in a testing phase, to see if this actually works to motivate them. I don’t yet have a packaged distribution, because I don’t have any documentation written, other than very rudimentary install docs. 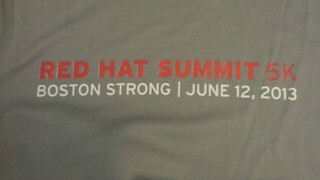 But you can check it out of svn if you want a copy. Patches are eagerly accepted, and if you’d like to participate on the project I’d be glad to add you to it.